The study group resumed after the summer break amidst much excitement and was well attended, with 16 members present. The workshop got under way with a summary of accounts and Secretary’s report presented by Janaki. 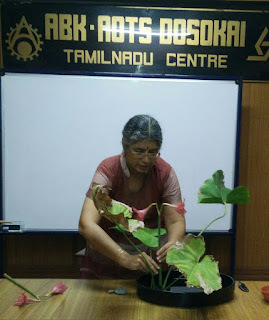 Mrs. Malathi Pandurang announced the themes and resource persons for the coming months. Sensei Ambika chose a wonderful theme for her demo—“My experience with haiku and ikebana” and briefly introduced members to haiku poetry. She read out translations of two poems that inspired her to do the arrangements. Ambika had written her own haiku to celebrate the welcoming carpet of yellow flowers in her parents’ garden. Members were fascinated by the concept and the facility with which Ambika recreated verse into perfect ikebana pieces. 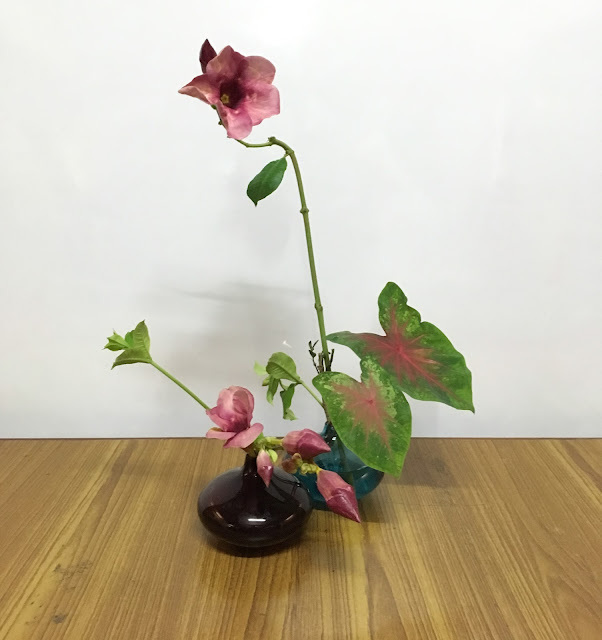 Of three arrangements she did, the first one was based on a frog jumping into a pond and the stillness broken by this. The simple materials she used were perfect for a pond scene and a pebble was thrown in to show the frog jumping. Ripples were created using thin flexible twigs and the end result was a feeling of tranquility amidst nature. One can feel the stillness of the pond. 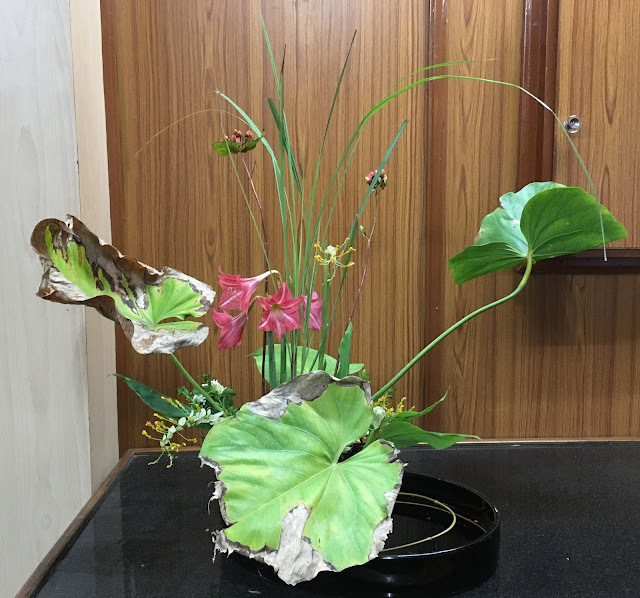 Anthurium leaves, lemon grass, Amaralis lilies, berries and jasmine branches for line. Ambika moved on to the next arrangement evocative of an ancient well overgrown with morning glory and a tangle of creepers that make it impossible for the poet to access the well water. She skillfully depicted this with a brown nagiere vase, ferns and allamanda. as the gnarled tree watches. 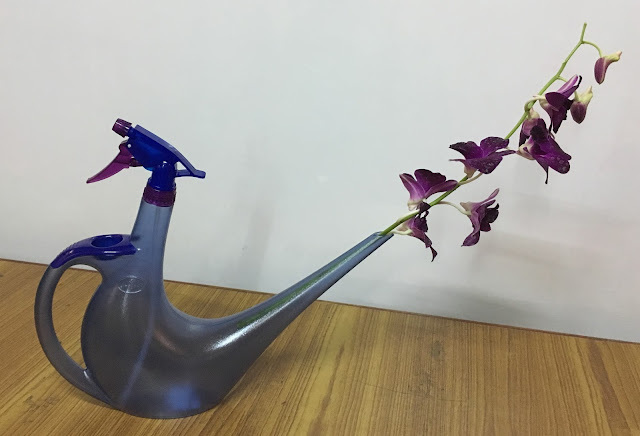 Inspired by the haiku poems Ambika wrote this poem recalling the pretty yellow carpet of flowers under the bottle brush tree in her parents' home. 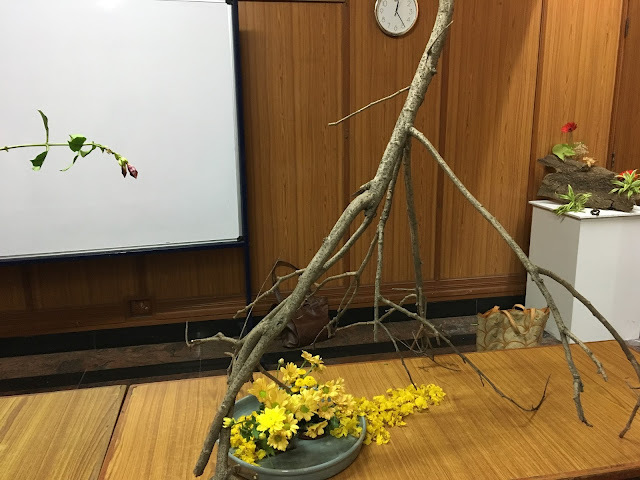 She used a peltaforum branch, yellow chrysanthemums and fallen Peltaforum flowers to showcase this beautiful scene. The members then got down to doing their pieces on minimalistic freestyle and it was a treat to watch so many interpretations of the theme. 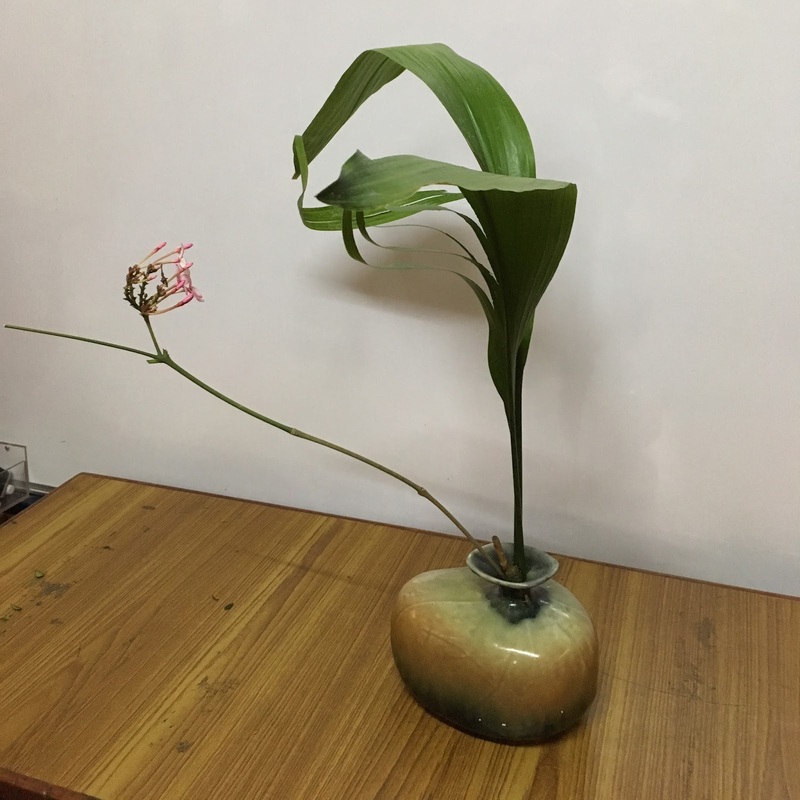 Sensei Malathi used a light green vase to showcase her aspidistra leaf interestingly split, and a solitary Copsia for a touch of colour. 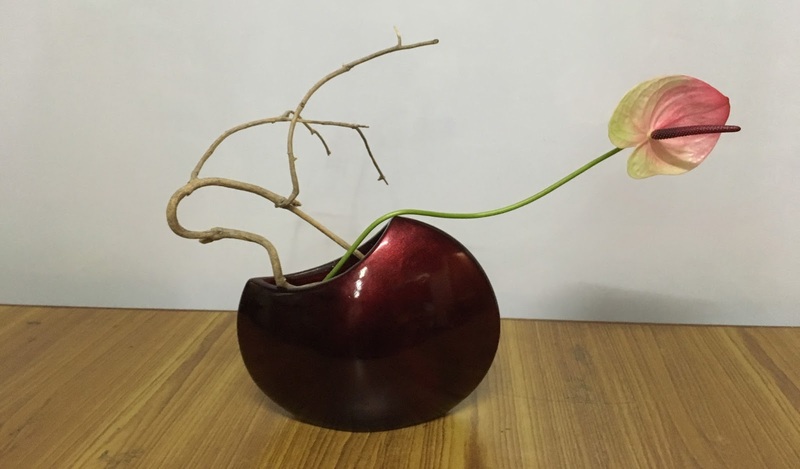 Sensei Trishala reflects the angular vase using anthurium flower and leaf. depicting strength. 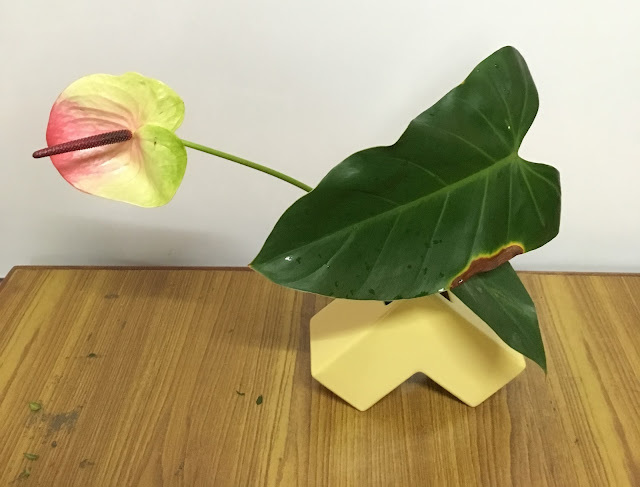 The flower though colourful is shy and hiding behind the leaf. 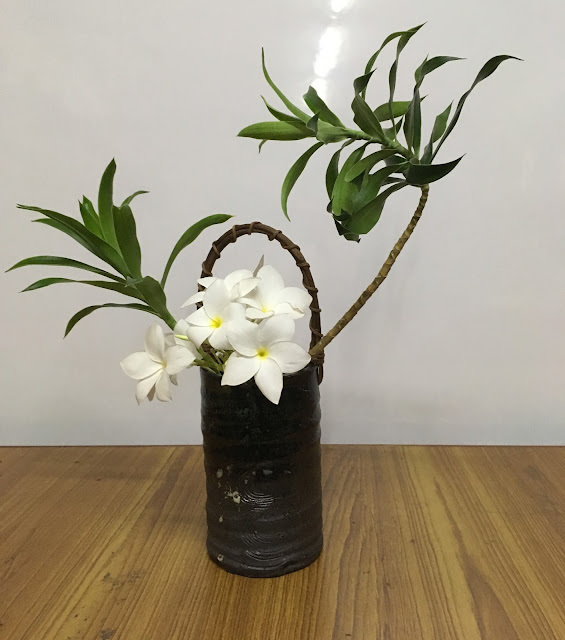 was Sensei Divya’s choice for flowers fresh from the garden. 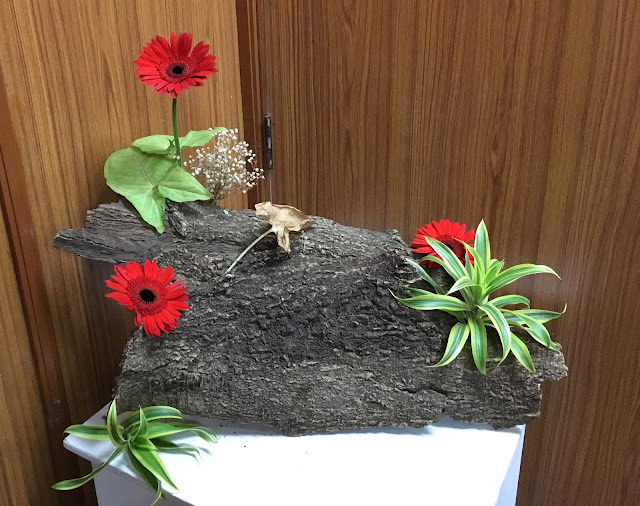 Chitra Thiagarajan created a natural look with a tree bark as a base for dracaena and orange zerberas. 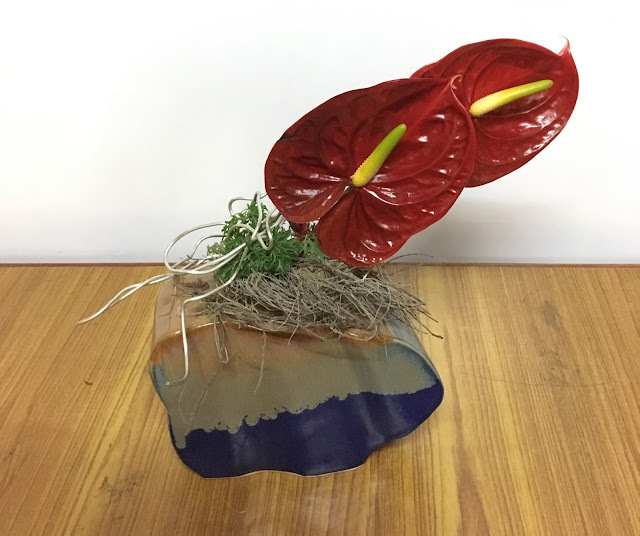 Bhuvana used a fragile looking bright blue vase with a designof cracked lines. 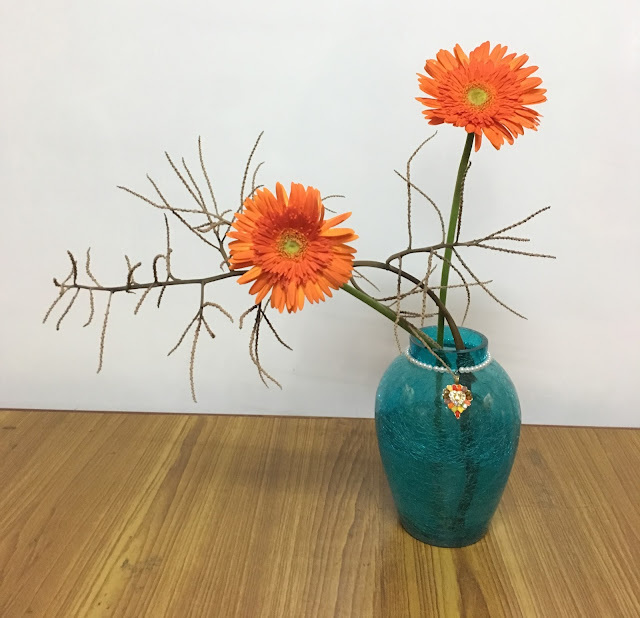 She used dry twigs to match the crisscross lines and bright orange zerbera for colour. Sensei Janaki chose allamanda and calladium from her garden, using two vases to blend the various coloursin a seamless arrangement. 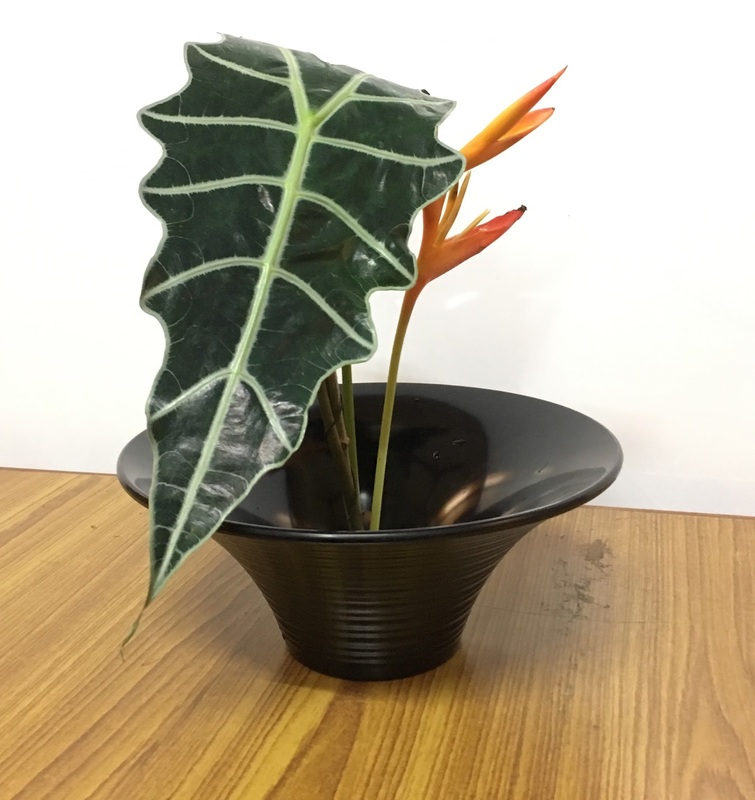 We look forward to the August workshop.